The classification of the wren family has long been an area of dispute among scientists. The commonly held view over much of the twentieth century was that wrens were very closely related to dippers and more distantly related to mockingbirds and thrushes. Given the obvious physical similarities between wrens and dippers—the stumpy shape, usually short tail, and rounded wings—as well as the fact that both groups build domed nests with a side entrance-hole, this seemed eminently reasonable. However, more recent work based on DNA studies has radically changed this picture. Wrens appear to be most closely allied to the New World gnatcatch-ers and gnatwrens, and rather more distantly to the creepers (treecreepers) and nuthatches; dippers, by contrast, are evo-lutionarily closer to thrushes than to wrens. The ancestral seat of the wrens is in the New World, but precisely where is a source of debate. At the time when most present-day passerine families were evolving, there was no continuous land bridge between North and South America. One theory postulates an ancestral center somewhere in present southwestern North America, followed by the invasion of South America. This viewpoint is by no means universally held, and an origin in northern South America has some advocates. The fossil record of wrens is extremely scanty and so recent as to be of little help in elucidating the geographic origins of the family. 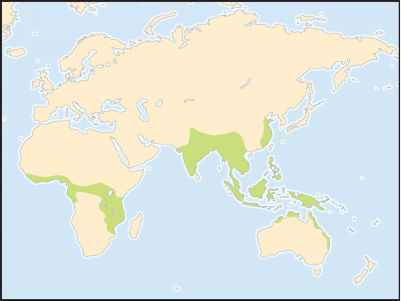 The greatest abundance of modern wrens is in southern Central America and northwestern South America. The precise number of species of wrens is a fluid and debatable quantity. Although only four totally new species have been described to science since 1945 (the most recent in 1985), different authorities have wildly differing opinions as to the taxonomy of the family. Thus the house wren group, occupying the Americas from Canada to Tierra del Fuego, has been variously treated as one species or as many as ten. Peters checklist contains 60 species in 14 genera; more recently, Clements has 78 species in 16 genera, while the most recent studies suggests 83 species in 16 genera. Wren taxonomy is currently in a state of great flux, and both the total number of species and their allocation into genera will almost certainly change in the near future. The bizarre and aberrant Donacobius, a raucous and rambunctious inhabitant of South American marshes, is sometimes classified as a wren, a viewpoint that varies among taxonomies.